This is a colorized version of a lithograph done by Adrian Persac during the spring of 1861. The vantage point of the viewer is toward the west. In the distance is a train on the tracks. Campsites are seen in the trees and soldiers parading and drilling in the center parade ground. In the center distance are the Commissary and Quartermaster buildings. In the left distant center would have been the Sutler's stores and photographer. You will notice civilians strolling about. It was popular in New Orleans for train rides of 4 hour's duration to visit the camp. Loved ones could reunite with soldiers soon to depart. It was an exciting time at Camp Moore in the early days when so many young men were off to win the war. You can readily see from this drawing the size of the present Camp Moore compared to the size of the original camp. Although 150 years have passed, the area is still largely like it was during the war with a cleared parade ground and wooded campsites, although the current woods are young and immature compared to the mature pines that existed in 1861. Beaver Creek, which the men used for bathing and drinking, still holds the southern boundary and the railroad that brought the men to Camp Moore and away as well, still occupies the same site. 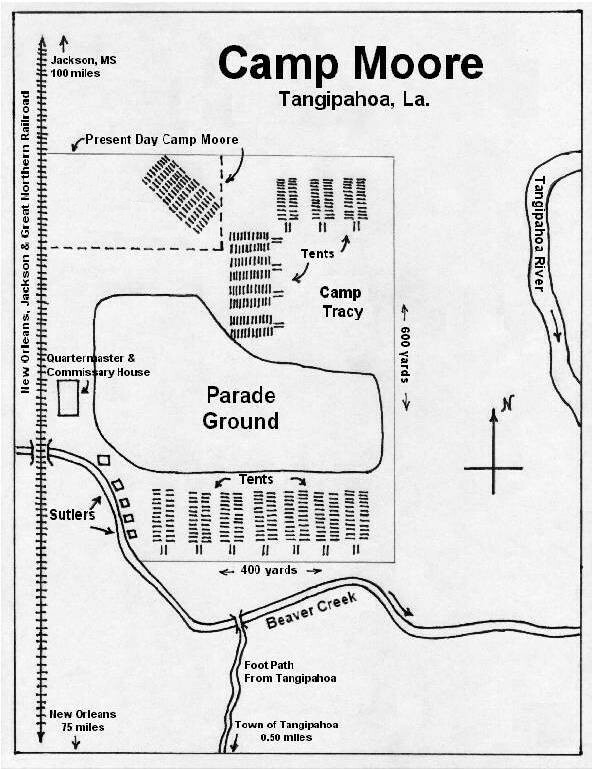 The portion marked "Camp Tracy" was also called the upper camp and was used when the lower camp was full, as often happened during 1861 and early 1862. 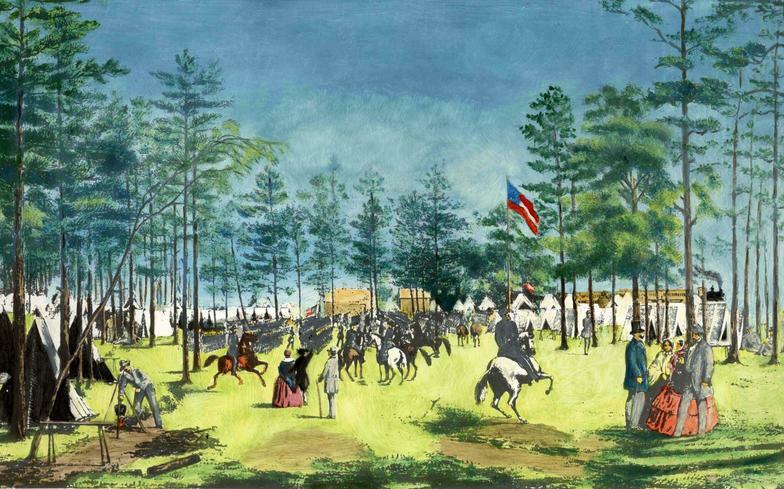 By late 1862, all of the volunteers were gone and the camp, for the next two years, was chiefly used as a conscript camp, a place where drafted men were organized and sent to Louisiana regiments. It was also used as a staging area for troop movements in SE Louisiana such as the preparation for the Battle of Baton Rouge on August 5, 1862.